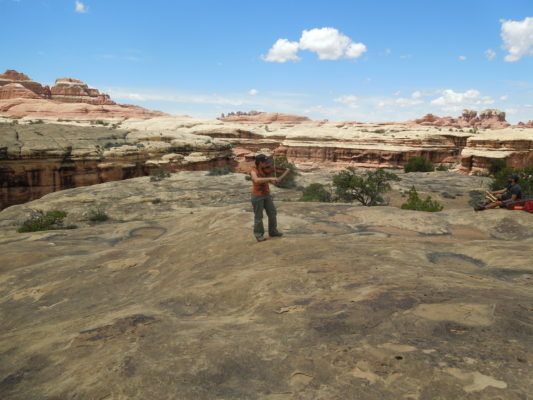 I had decided not to write about this hiking trip to Arches and Canyonlands National Parks. It was not that it wasn’t wonderful or beautiful, because it was both. I just didn’t feel inspired to write. Until something very unique and special happened. We were a group of eight with two guides, Jeff and Tamara, both excellent and thoughtful leaders. They are also professional musicians: he on the saxophone, she on the violin. At our request, they had agreed to play for us. I had presumed it would be at the gorgeous lodge high up in the La Sal Mountains where we were staying. But they had something else in mind. It was on our fifth and final hike. 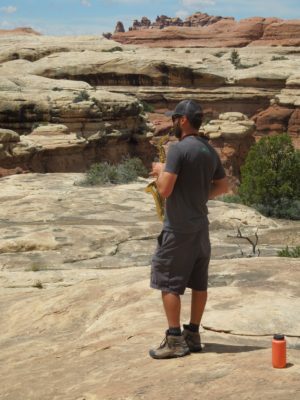 They carried their instruments deep into the region of Canyonlands called The Needles, a place of spires, turrets and fins carved by nature from sandstone of various colors and compounds. Jeff guided us to a naturally-formed amphitheater, expansive and magnificent. We sat down on the slickrock and he walked some distance away. Slowly, he began to play, just a few notes at first and then more. Every note echoed in the canyon. It was stunning. After awhile, Tamara joined him, and they played together, the sound extraordinary in this physically and acoustically perfect setting. Then he stopped and she played alone. Their concert brought tears to my eyes as it reminded me how precious such moments are and how joy can be found in the most unexpected ways. Adele, welcome to Utah and ‘our back yard’. I am glad you enjoyed your trip to Southern Utah, and the musicians made it memorable. Come back again. We were with you in SE Asia. Of course I remember the two of you and that most memorable trip to SE Asia. Great to hear from you! Ah… I get tingles thinking about hearing the music in that setting. What lodge did you stay? One of these days I’m joining you!! Patty, the company is REI. 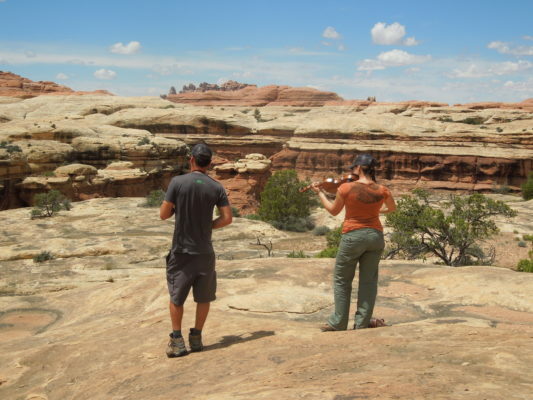 The trip is called Arches and Canyonlands National Parks.